That’s right this is my 150th review and the last of the of the Bier Cabinet Spring Cleaning reviews. I have seen this beer around for a long time and never had the nerve to spend $20.00 on it; especially on something that I’ve never had before. Well about two months ago I picked it up on an impulse. It has been setting in the bier cabinet ever since. So tonight we decided to give it a whirl; the BierVlog son that’s still not Vlogging and I. 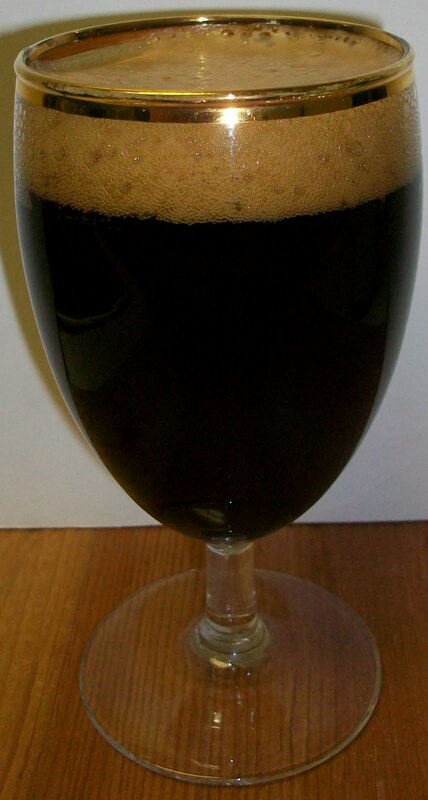 The beer pours a dark brown completely opaque with no light getting through the glass whatsoever. This beer also produced a modest but dark tan almost chocolate head. The nose is powerful with dark roasted malt aromas, chocolate and coffee notes and a very interesting smoky bourbon aroma. With a slight swirl of the class light hops and sweet alcohol are emitted. This is somewhat intriguing and also a little intimidating. OH MY! What a first sip; sweet, creamy, malty, and very warming. Wow, that was an amazing first sip. It starts out with rich sweet roasted malts up front on the tip of the tongue, then a extremely creamy mouthfeel in mid-sip. I was waiting for something harsh to hit in mid-sip but it didn’t, it stayed very smooth and creamy. Toward the back-end you start to pick up some of the alcohol along with a slight increase in the robustness of the roasted malts. The back-end through the swallow is incredibly smooth for an 11% brew. Although you can really pick up the alcohol along with the smoky bourbon cast notes in the back end. The finish is really dry for such a malty brew. I figure that is mainly due to the alcohol. The final aftertaste is a little bit of everything; dark malts, some dark fruit, chocolate, sweet alcohol, a slight smokiness and a pinch of coffee. This is one amazing brew. Although it is high in alcohol it is also very easy drinking. As this beer warms the flavors are changing; it’s like a chocolaty, smoky bourbon, malt beverage. This is still an exquisitely smooth and rich brew. I’m trying to review this beer and plan my next Belgian event at the same time and it’s a little distracting. I’m looking at and evaluation candidates from a list of over 55 Belgians that are available in kegs. Discussing that and this brew is tasking what brain cells survived the 70’s. So let’s get back to the brew, there will be plenty of time to discuss the next Belgian Event later. This is an interesting beer in that it is a very strong beer but not a very intense beer. The low hop presence and the rich malts along with the Bourbon Cast aging smooth this out to a velvety creaminess. Well this is a solid A for me maybe even an A+. This stayed smooth and creamy all the way through. It never picked up any harshness or unpleasantness as it warmed, although the alcohol was more predominate toward the end. This was a nice treat but I’m not sure whether it was worth $20.00 a bottle. Let’s put it this way, I don’t think I’ll be buying another one. 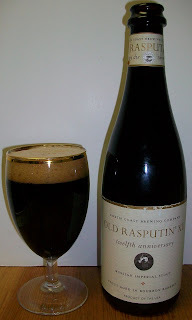 There are comparable imperial Russian stouts out there for a lot less money. All and all this was very unique brew with an intriguing Bourbon Cask twist. Not sure about the 20 spot but still one enjoyable brew. I have no regrets, put it that way.